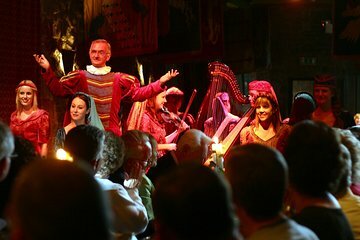 Enjoy a night of medieval enchantment at the Knappogue Castle, including a feast fit for a king and free drinks. Be welcomed to the castle, and watch the ladies of the castle sing and perform traditional Irish dances. Make your way to the banquet room with long oak tables, bench seating, and candlelight. Listen to wonderful harp and fiddle music while you eat, and end the night with more medieval-themed surprises and music. Arrive a little before the starting time of your banquet at Knappogue Castle in Ennis, so you won’t miss a thing. Please note the characters you meet throughout the night are playing a part of someone who might have existed during the medieval times. This 2.5-hour banquet is being thrown for all the “guests” by the Earl. Be greeted at the castle’s front entrance by the Earl’s Butler and the ladies of the castle. They’ll take you over to Dalcassian Hall, where you can mingle with the castle entertainers, and try your own goblet of mead (a honey wine). During this experience, be serenaded by Irish music, and watch traditional Irish dances. Hear stories about the castle’s history, and enjoy a 4-course meal by candlelight in a traditional medieval banquet hall with long wooden tables and wooden benches. You’re in store for a lovey night filled with food, friendship, music, and a few surprises. Please see the Itinerary below for the menu. This was a wonderful Irish Party evening with interesting food and great entertainment. Very entertaining dancing, singing, storytelling, music, themed costumes, well organized meal service...Definitely a memorable part of our trip and worth money! Not to be missed, this is a truly delightful and entertaining evening: the setting is a historic medieval castle, resplendent with formal gardens, courtyards, winding stone corridors, banquet rooms filled with refectory tables, etc., all set in a beautiful pastoral setting guests are greeted as Lords and Ladies by a butler truly blessed with the Irish gift of the gab -- witty and hilarious throughout the evening meade flows at the reception in the courtyard prior to an excellent four-course meal, served in the banquet room by enchanting ladies who are dressed in period costumes, who sing and dance and play harps...They share the stage with a young lad straight out of Riverdance! We were 10 in our party, with ages ranging from 3 to 74 and everyone simply loved it! Pure magic! Food was good. Entertainment was fun. The women's voices were beautiful. We really enjoyed the young male's dancing. He obviously was enjoying himself very much and he was quite good. The whole evening was delightful.